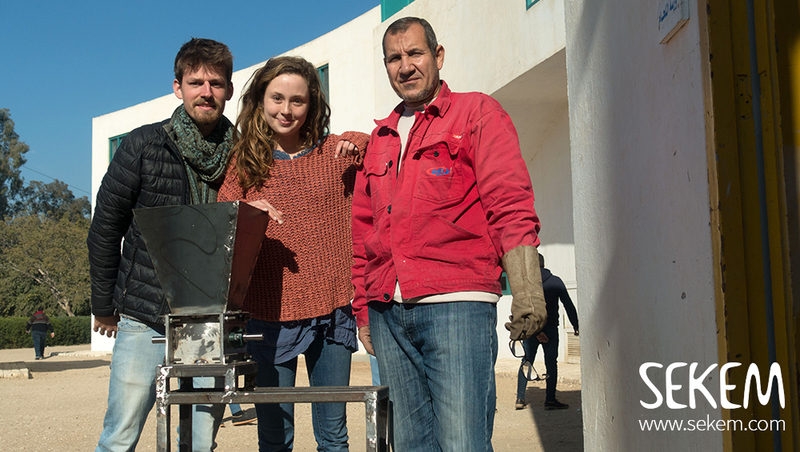 The German actor Hannes Jaenicke quickly unraveled SEKEMs holistic approach to sustainable development, when he visited the initiative in 2016; SEKEMs Cultural Life is a crucial pillar for its entire understanding of sustainable development. That is why both SEKEMs cultural institutions and companies hosted various cultural activities for the employees and among SEKEM farmers. In the end of January snowballs were fluttering in SEKEM. Snowballs in the desert? Yes – within its Farmer-to-Farmer Program, USAID provided a training course to SEKEMs co-workers, who are working in one of the food processing companies. International trainers and an ambitious Egyptian team were imparting the participants the important topic of food safety. During the training the serious topic was approached through fun and games. Participants wrote their questions on a white paper, crumpled it and threw it through the room. The ones who caught the “snowball” had to answer the questions. “The participants are full of life and really willing to learn. It’s wonderful to see how they are smiling all the time – that’s the best condition to learn”, says one of the Trainers. In 2016, 15,694 Training hours have been provided to all SEKEM employees (36% less than last year). The total decrease is due to fluctuations in the Human Resources and Development team and different priorities. SEKEM at its core is about human development and we are ready to spend more resources into capacity building but we need to develop the right approach. We are convinced that the conventional approach of HR management that was developed in the West does not necessarily cater for our needs and local culture. Also we see that consciousness development and awareness about different human development stages is far too much neglected in the world-view of most HR managers. The development of an own integral human development approach is therefore a big priority for us and our relative emphasis on cultural and arts capacity building will be maintained. SEKEMs contracted farmers, employees and their families also attended the SEKEM festivals, which showed a diverse artistic program on stage of SEKEMs Roman theater. In March, just one day after the 79th birthday of SEKEM founder Dr. Ibrahim Abouleish, SEKEM held its annual Spring Festival. In honor of this occasion, Gamal Mohamed, a young man, who knows SEKEM almost since he was born, congratulated Dr. Ibrahim Abouleish with a self-written poem. Gamal is a wonderful example for individual development, fostered through SEKEMs cultural institutions; he visited the nursery, the kindergarten and the school, and now he is going to study at the Heliopolis University. 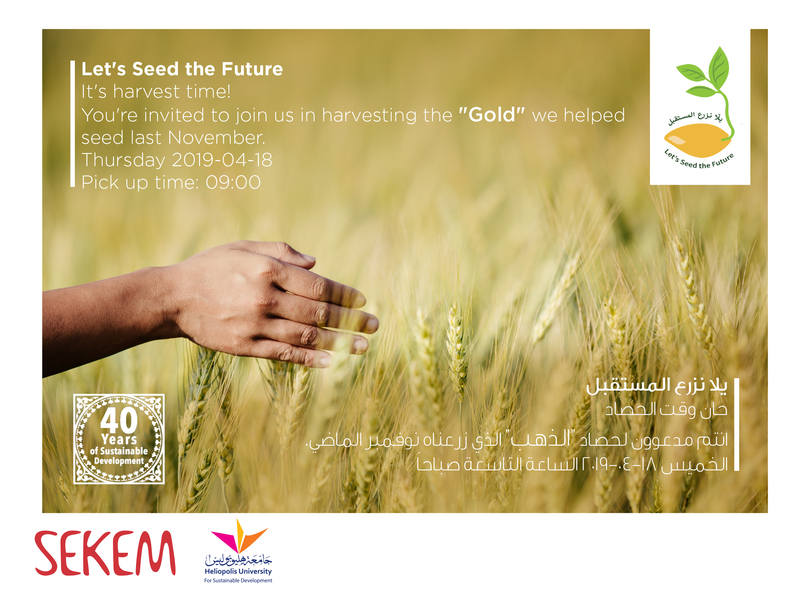 SEKEM celebrated the second festival in autumn and herewith 39 years of sustainable development. The co-workers of SEKEMs companies performed on stage and presented short skits written by themselves, showing the challenges they face in their daily work life and how they contribute to overcome them. Also, SEKEMs pupils and students enjoyed the festive celebration as well as SEKEMs holistic learning approach in general. The rapidly increasing number of children at SEKEMs nursery shows that the different offers provided by SEKEM enjoy great popularity. Supported by ambitious friends, SEKEMs childcare institutions are improving their quality of education and children’s development. The Kindergarten was able to reduce the number of children for its two groups. Also the nursery with its three groups and six teachers could improve their quality by reducing slightly the number of babies. There is much more demand from our working mothers and from the surrounding community but quality must come first. 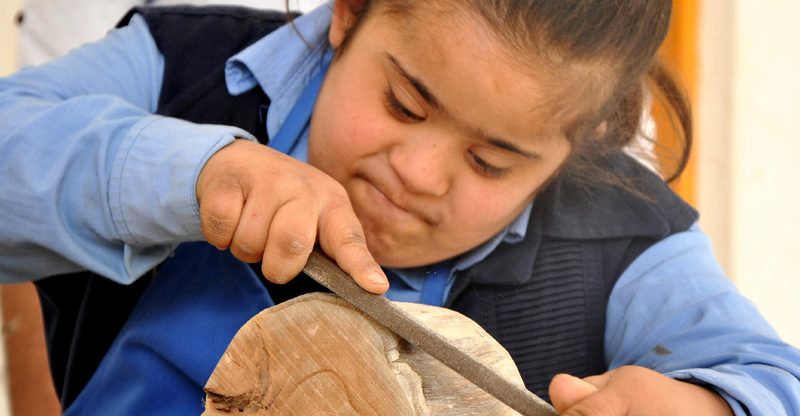 The SEKEM special education program has five groups and 6 teachers, which is a unique set-up in Egypt. Since the end of the year, SEKEM children can enjoy a new playground in the middle of the nature of the SEKEM Farm, for instance. Also, the SEKEM School continued its universal human development notion in 2016. The operations have been kept stable. Also here the intention is to raise quality not quantity and to diversify the group of children more in terms of living place and socio-economic and cultural background. Besides the weekly school celebrations where pupils present their artistic skills on stage, there have been various additional cultural activities throughout the year, which aim to strengthen the children’s individual potential. For example, during the long summer vacations there was a choir offered to SEKEM pupils and staff, different educational trips or handicraft courses. The pupils at SEKEMs Vocational Training Center benefit from these cultural learning offers, too. In total the VTC offers 7 vocations with each 3 years of curricula including language and maths. The 21 classes are managed by 18 teachers. In general the demand for the dual education system is increasing strongly but SEKEM recognizes the importance to carefully select the intake of students and a lot of qualification challenges remain. The first female manager of the electric engineering department, Hanem Mahmoud revealed how she and her students performed a play about sustainability and security in regards to electricity during the school celebration. Furthermore, SEKEMs efforts in spreading a holistic approach to education brought further steps. 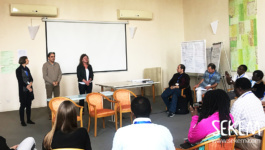 Within the context of the project Education for Sustainable Development (ESD) in Egyptian public schools that started already in 2011, the Heliopolis University organized a five days-workshop for teachers and trainers from the governmental education sector. According to an agreement between the Heliopolis University’s Center of Excellence and the Egyptian Ministry for Education, 150 UNESCO affiliated schools shall integrate ESD within their curricula in the near future. In 2016, the first students of the Heliopolis University for Sustainable Development graduated. The Business Department students spent their final semester with analyzing the market for products of SEKEMs company ISIS Organic. The students thought of innovative and practical ideas and solutions to address the current challenges which the economic situation in Egypt is facing. All nine students could successfully pass their final graduation exam. In total, at Heliopolis University 1075 students were registered, an increase of 269 students or 33 percent. Besides, the Heliopolis University promoted different cooperation’s with other international universities. The aim was to advance their common vision of holistic interdisciplinary science that fosters a sustainable future. Among others, several teachers from the Dutch Zuyd University visited the Heliopolis University to give classes and plan a deeper collaboration for the future. Their travel costs were funded by the SEKEM Friends Association Netherlands. As SEKEM believes that there is no progress without a scientific basis, the initiative is committed to research. In 2016 mainly the Heliopolis University has been working on different research project. 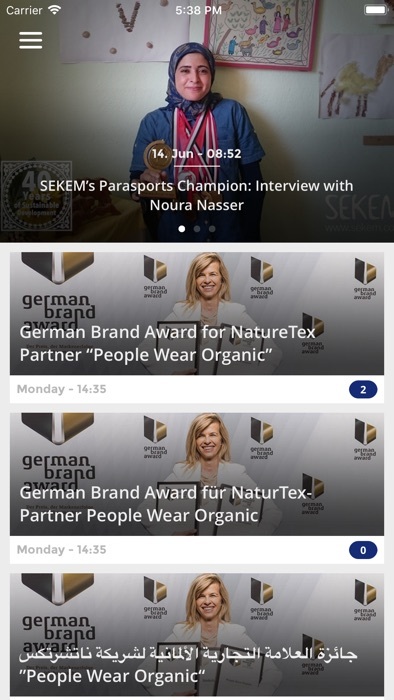 In total Heliopolis University together with SEKEM and other partners were involved in 19 funded projects – 3 more than last year, which shows the particular strength of this innovation ecosystem. One example for its high standard of research are the studies on sustainable medical products such as a device for testing the infection of Helicobacter pylori bacterium, a pregnancy test, a drug screening test or a test device for the diagnosis of Hepatitis C virus conducted by the Biomedical Research Department. According to the latest World Health Organization (WHO) report, Egypt has still one of the highest prevalence of Hepatitis C in the world. To combat this disease, SEKEMs Medical Center participated in a very important campaign for whole Egypt in 2016: “Egypt free of Hepatitis C by 2020”. In March the Medical Center was selected to be the focal point of the area for treating Hepatitis C patients coming from the surrounding villages. By the end of the year, more than 1800 patients have been successfully cured and more than 44,000 patient visits have been recorded – an increase of almost 10 percent compared to last year. As mentioned under Economic Life SEKEMs farmers are a crucial part of SEKEMs value creation ecosystem and hence have been specially taken care of in 2016. 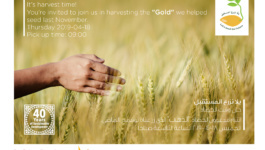 Additionally to the regular meetings and training sessions that take place all over Egypt where the different biodynamic farmers are located, new monthly meetings have been implemented. Within the framework of integrating the contracted farmers more into SEKEMs holistic approach, these meeting shall give the farmers deeper insights to all topics related to their work but also to the development of communities. SEKEM wishes to achieve positive social and cultural impacts for the communities of their farmers including women and youth. Therefore, SEKEM developed a strategy for holistic farmer development and identified specific interventions. To cope with the challenges identified through the assessment visits and meetings with women, SEKEM opened classes for women nearer to their houses. Female teachers were selected who would be able to continue for long time to start adult education, which is different in goals, content, methodology, teaching and learning skills, as well as monitoring process. Teachers were trained by professional trainer from the Adult Education Association (governmental entity) on different ways to deal with teenagers and adults starting from age 16+, in addition to other skills like communication. An additional service offered to the target group is to support them in issuing new identification cards so that they can join the final exam. In the context of increasing SEKEM farmers’ awareness on animal health, SEKEM, in cooperation with the Farmers Development Association (FDA), organized three veterinary convoys in Behira in August 2016, under the supervision of Alexandria University’s Veterinary Medicine Faculty. During this program, SEKEM targeted 53 farmers in three villages (Mokhtar, Hager and Kom Aziza) and treated 600 cattle and buffalo, in addition to around 380 sheep. Women’s economic empowerment is a prerequisite for sustainable development and pro-poor growth. Achieving women’s economic empowerment requires sound public policies, a holistic approach and long-term commitment and gender-specific perspectives must be integrated at the design stage of policy and programming. Financed by the Hand-in-Hand program (initiated by Rapunzel, one of SEKEMs long-term partners) the aim was to develop 50 women in Fayoum by providing them trainings on small food industries production, selling and marketing their products. Public education in Egypt is for free. But this is fool’s gold. It is not uncommon that there are up to 70 students per class. Teachers are underpaid, which forces them to take up a second job and due to the big classes, children have to take extra lessons to pass. The public school buildings and surroundings are often in bad conditions. Proper cleanliness and hygiene is missing. The curricula are often targeting monotonous learning instead of fostering deeper understanding or encouraging independent thinking. To counteract this crisis one cannot start early enough and SEKEM supports nurseries in the farmers’ communities to provide adequate pre-school experience for babies and young kids. The aim is to strengthen their ability to understand, communicate and learn with different intelligences. SEKEM is not intending to open new nurseries but to develop existing pre-school based on the applied practice from SEKEM nursery, kindergarten, and school. Currently, SEKEM is active in this field at 2 nurseries in Kafr El Sheekh governorate. 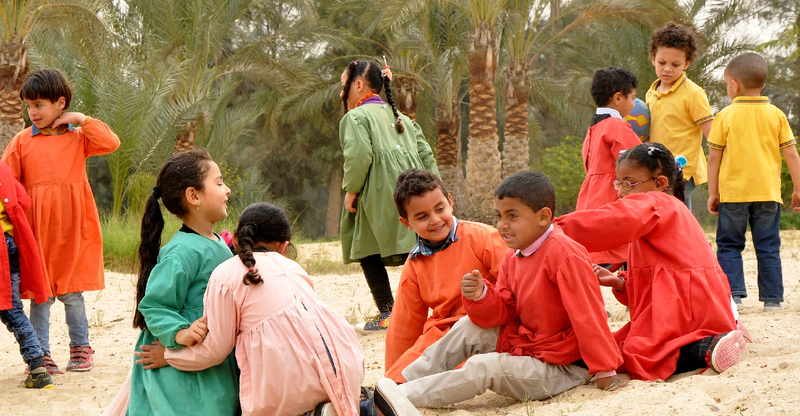 Furthermore, 2 nurseries in Fayoum and Sharkia are under assessment and formal preparation. In Kafr El Sheikh around 120 kids are benefiting from this support; in Fayoum around 70 -100; in Sharkia the number of beneficiaries is still under evaluation.